Boron trifluoride only has six valence electrons and is one of the relatively rare second period covalent molecules that disobeys the octet rule. There are three bonded groups and so no lone pairs. Six electrons implies three electron pairs and therefore a trigonal geometry. 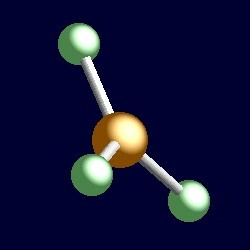 The geometry of boron trifluoride, BF3. You can use your mouse to manipulate the molecule in the right hand "Jmol" image.